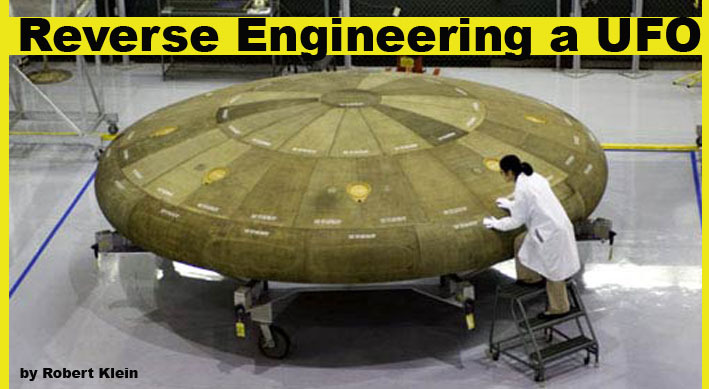 Reverse Engineering a UFO: Blueprints for an alien space ship? 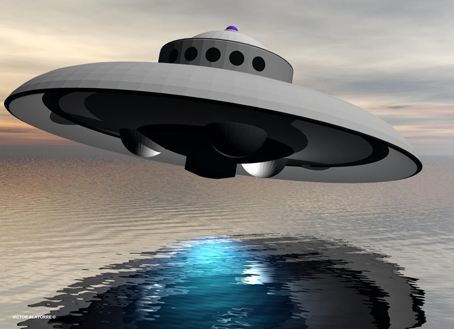 For over sixty years the UFO phenomenon has been capturing our imagination. In this time, all attempts at "reverse engineering" the putative craft have been futile. During the first decade or so, many researchers were inspired to work with the stereotypical "disc" shape and many attempts were made to develop prototypes of a flying "disc" while studying its aerodynamics. As a fourteen year old, I was also inspired to explore these issues to their inevitable dead end. It was clear from the litany of conforming evidence that we were dealing with apparent magnetic field effects. But back in the 1960s, that revelation did not get us very far, no matter how clever we thought our knowledge of materials and electromagnetism. My first book report, in my junior year at high school, was on Keyhoe's book UFOs Are Real, which is still likely as good as it gets. All that has changed now. 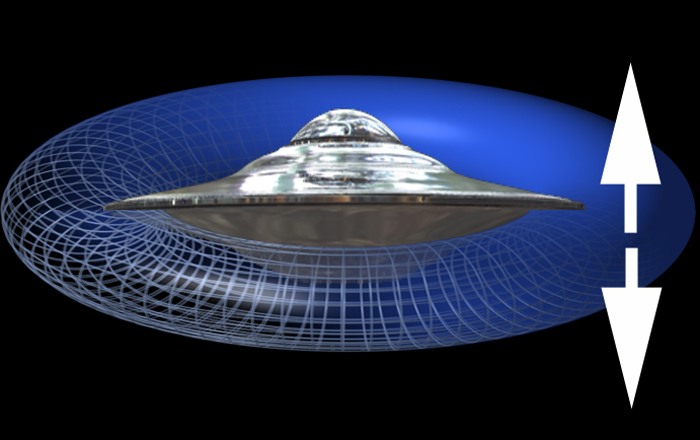 Recent discoveries have finally paved the road to the reverse engineering of the UFO. In the sixties, we faced two deal breakers with the UFO phenomenum. We had no answer for lift and no good answer for energy supply except a hand wave at fusion energy. We did have an answer for motive power and controls in the form of magnetic field management, provided the craft was light enough and/or the generated magnetic field was strong enough. Computer power sufficient to tackle this type of configuration was certainly on the horizon then. The craft is a magnetic field exclusion device. This is extremely important because that is the source of lift. We know that this can be achieved from our experience with a block of super conducting material. It follows that a skin of superconducting material will exclude external magnetic fields. 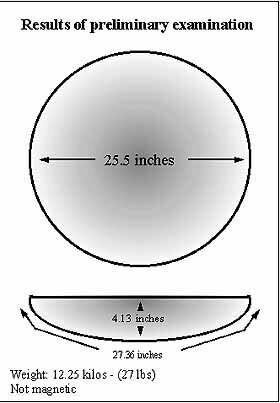 From then on, the engineering is about craft density and both the sphere and the flattened disc optimize craft density. Thus observation is confirming the nature of the source of lift and no new physics is called for. A superconductor has the ability to carry electric current without dissipation. 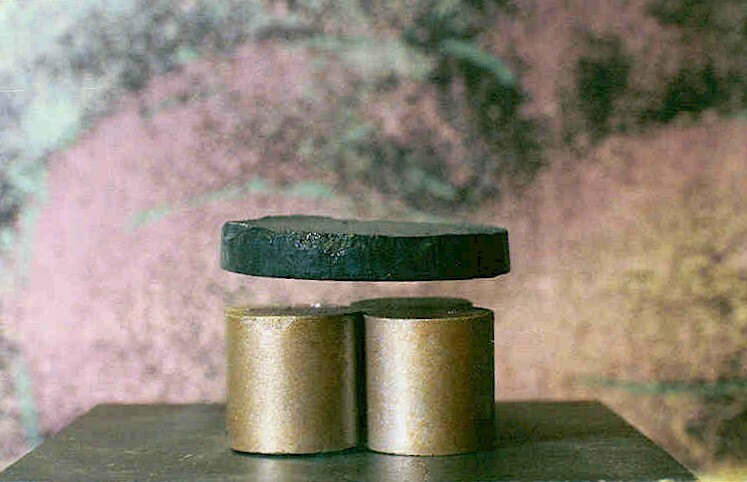 The perfect diamagnetism of a superconductor makes it possible to levitate magnetic objects. Superconductivity, as we currently understand it, requires that the material be maintained at very cold temperatures. An excellent analogy is that of a balloon. It has extremely low density compared to the surrounding atmosphere. We can surmise that the craft is set to float without motive power outside our atmosphere. This also infers that the small craft we observe are necessary for deep penetration into the atmosphere. It takes a fair bit of energy to get down to ground level. The flip side of this is that very large mother ships will exist in order to have a very low craft density. These mother ships are able to develop the power to accelerate in the interplanetary areas where magnetic field strength is much lower. We now know that a first prerequisite must be a skin containing a laminar layer of superconducting material. This also infers an adjoining layer, both under and over that is magnetic solid state refrigeration (SSR). We can assume for now that each layer is a few atoms thick. Powering this up will exclude the ambient magnetic field and provide ferocious lift on the Earth's surface. So how close are we to having the right materials? Scientists have been experimenting with superconducting ceramics for over twenty years. Other types of superconducting material are popping up in the labs all over the globe. If we decided to manufacture a layer of such ceramic today we likely could do it without much trouble, but getting the right temperature profile could be a lot harder. I recently reported on the discovery that super conductance can be achieved at the interface between metal and insulator at up to 30 kelvin. Here is the link. The new research involved a lanthanum copper oxide compound that can be doped over a wide range of compositions, which was used to study a potentially new mechanism of superconduction. A substrate of LaSrCuO4 was used, and an epitaxy technique grew atomically-perfect thin films of three derivative compounds: an insulator and a metal that show no superconductivity, and a superconducting variant with a transition temperature (Tc) of 40K. By growing literally hundreds of combination of interfaces and film thicknesses, the researchers were able to observe superconduction at different temperatures, including superconduction at the metal/insulator interface. While there is no definitive explanation available for this interfacial superconduction, it opens the door for further research into engineering superconductors out of non-superconducting materials. The small length scales at which the superconduction occurs may make it appropriate for micro- and nanoscale devices. Nature 455, 782-785 (9 October 2008) doi:10.1038/nature07293; Received 15 June 2007; Accepted 25 July 2008, "High-temperature interface superconductivity between metallic and insulating copper oxides." This first discloses that we are working on the problem at the atomic layer level which is surely what the idea of a working skin implies. It also suggests that a working layer need only be a couple of atoms thick. This makes the cooling task far more tractable. One could even envisage a mechanical system if it ever came to that. Next we have this recent note from a lab in France that I covered in this post. Nanocomposites produced from metallic glasses could make promising magnetic refrigeration materials according to new work by scientists in France. The materials are as good as the best currently available magnetic refrigerants with some added advantages. Refrigerators using such materials would be environmentally friendly and more efficient than existing devices that rely on a vapour cycle. 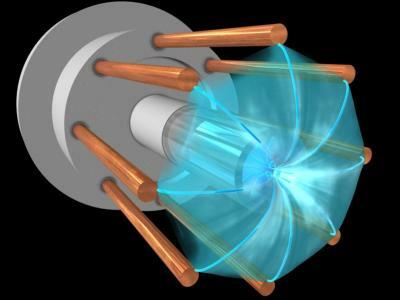 "Magnetic refrigeration is an environmentally friendly cooling technology, unlike the gas-compression refrigerators used today," team member Stéphane Gorsse of the Institute of Condensed Matter Chemistry of Bordeaux (ICMCB-CNRS) told nanotechweb.org. It uses no ozone-depleting, hazardous chemicals or greenhouse gases (such as hydrofluorocarbons used in conventional refrigeration systems). Moreover, the energy efficiency can reach up to 60%, compared to just 40% for the best gas-compression refrigerators. 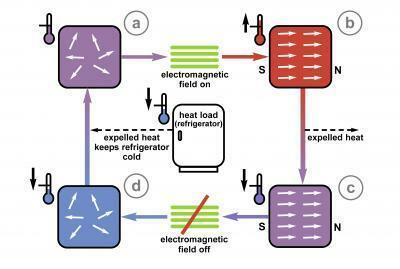 ScienceDaily (Feb. 12, 2009) -- Your refrigerator's humming, electricity-guzzling cooling system could soon be a lot smaller, quieter and more economical thanks to an exotic metal alloy discovered by an international collaboration working at the National Institute of Standards and Technology (NIST)'s Center for Neutron Research (NCNR). The alloy may prove to be a long-sought material that will permit magnetic cooling instead of the gas-compression systems used for home refrigeration and air conditioning. The magnetic cooling technique, though used for decades in science and industry, has yet to find application in the home because of technical and environmental hurdles -- but the NIST collaboration may have overcome them. But conventional gas-compression refrigerators have their own drawbacks. They commonly use hydrofluorocarbons (HFCs), greenhouse gases that can contribute to climate change if they escape into the atmosphere. In addition, it is becoming increasingly difficult to improve traditional refrigeration. "The efficiency of the gas cycle has pretty much maxed out," said Jeff Lynn of NCNR. "The idea is to replace that cycle with something else." The alloy the team has found a mixture of manganese, iron, phosphorus and germanium is not merely the first near-room-temperature magnetocaloric to contain neither gadolinium nor arsenic rendering it both safer and cheaper but also it has such strong magnetocaloric properties that a system based on it could rival gas compression in efficiency. Working alongside (and inspired by) visiting scientists from the Beijing University of Technology, the team used NIST's neutron diffraction equipment to analyze the novel alloy. They found that when exposed to a magnetic field, the newfound material's crystal structure completely changes, which explains its exceptional performance. "Understanding how to fine-tune this change in crystal structure may allow us to get our alloy's efficiency even higher," says NIST crystallographer Qing Huang. "We are still playing with the composition, and if we can get it to magnetize uniformly, we may be able to further improve the efficiency." They have developed a metal glass that acts as a magnetic solid state refrigerant (SSR) with an effective range of around 100K. This is extraordinary compared to prior experience which achieved only 10K. Thus we can envisage a sandwich of three to four layers of metal glass with an operating range of as much as 300K to 400K, which is more than enough to strip heat away from a superconducting core layer. The idea of a multilayered sandwich of specially engineered metal glass and a superconducting core is completely viable. We have found the first examples and it is a matter of chasing down the right combination to manufacture a skin for a magnetic exclusion vessel. It will not be easy or easy to convert that knowledge into a manufactured product, but we know now that this can be done. Then there is the problem of energy storage. Here EEStor is leading the way with ultra capacitors storing energy in micron and nanometer sized balls. The astounding thing about this research is that the first published application patent was for a battery skin inside body armor. These recent patent disclosures have opened the door to a superior energy storage system that allows the fabrication of a battery skin. This means that this skin can be added to the inside of the exclusion skin of a UFO providing a massive energy storage capability. This is particularly true as we advance this technology with progressive improvements. One last addition to this skin sandwich is an outer layer of graphene [above]. This is a newly discovered substance and represents a new form of our old friend carbon. It is the strongest known material and forms a flat layer of tightly bound carbon atoms that will conduct electricity. It will be on the outer surface of the skin and naturally accommodate externally generated magnetic fields and currents. It may also absorb visible light as does graphite and carbon itself. Again, here is my link on the subject. 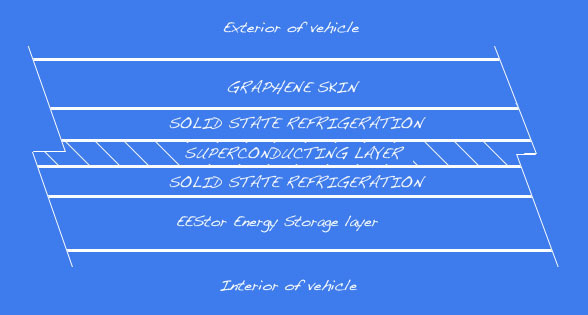 Therefore our working skin can be assembled in layers of at least from the outside inward of graphene, SSR, ceramic superconductor, SSR and EEStor energy storage skin. We can also anticipate an additional layer of circuitry and metal glass on the inside. It should be even tough and strong. The graphene layer was suggested by observations made regarding the Pomare disc which is most likely the best known report of a likely lost component of an UFO. The observations are over a decade old and it was made long before graphene was discovered in 2004. Yet I recognized the importance of the Pomare observations because of the outer graphene and the interior metglas and an open edge that revealed layering to the eyeball. I have long anticipated such layering of ceramics and metal glass, but it is just now that the practicalities are been addressed in our labs. I imagine that I was the only reader not surprised by the reported description of the Pomare Disc. We now have our magnetic field exclusion device that rides the magnetic fields of earth and the solar system like a soap bubble. The remaining question is how to accommodate magnetic fields generated by the electron flow through the other layers. It could even be that the magnetic exclusion can be used to facilitate the refrigeration aspect. All of this will be exciting work for the lab. There is obviously plenty to do, but it is now directed and understood. And yes, we need to round up the Pomare Disc and other artifacts if possible because it surely is a short cut. For our next trick we need to move this bubble around. Here at least we have an option. We need to run a powerful current in a ring around the craft orthogonal to the desired direction of motion. This will induce a strong magnetic field as a torus [above] around the current ring. We obviously need to vary the direction of this ring to guide the motion of the craft as the induced field reacts with the external magnetic environment. At this point it is natural to assume that we are describing physical current guides, but recall that the graphene surface is very conductive even if it is adjacent to a magnetic field exclusion surface. It becomes easy to also envisage a strong current flow from the top and bottom around the rims creating very powerful magnetic fields with a fair bit of directionality control. We postulate that any magnetic field configuration imaginable can be generated around this bubble without been too difficult from an engineering design perspective. This is a bit of a hand wave, but we all know that we have been dealing with exactly these issues for two hundred years. It is a nice engineering challenge to arrive at an elegant solution. We need a lot of electrical power to operate this craft and that means access to a small compact fusion power device. The obvious device protocol that satisfies our needs is the focus fusion device now been advanced. It consists of an anode barrel surrounded by eight copper posts acting as cathodes [ see below]. A pulse of current originating in a capacitor jumps from the cathode into the anode forming a strongly wound bundle of plasma filaments that arrive at the bottom of the barrel forming a plasmoid that contains the reactants and hurls them together at the temperatures needed. Work has begun to fine tune the device and discover its limits but a pulse of ions generates a current pulse in one direction and further energy must be bled of in the other direction. It is all very promising and actually looks just like what the doctor ordered. A next stage may see graphene replace copper in the cathode and anode which should be a major improvement. Again I reported on the device and also posted the company's slide show in the second link. The slide show is very compelling and it is easy to imagine the copper been replaced by graphene which is almost a super conductor in its own right. It is worth the effort to work through each slide. We have a prospective device that can be built small enough and powerful enough to provide all the necessary power to operate this UFO design. It apparently works now, but needs to be brought up to and past break even as is true for all fusion systems to date. This still looks like it is very close to operational success and deserves maximum support. All the ingredients for an operational UFO are today in the laboratory been advanced at a very quick pace. We have already mastered digital control systems and the related hardware. We are about to master the manufacture of multilayered atomic skins able to produce the needed characteristics. And the direct fusion device needs a major research drive using graphene in its construction. These problems are hardly trivial but they are very close to solution if not in fact solved. Most importantly, we now know what we must focus our research efforts on and why we must. Once we master manufacture of the skin, it will be possible to build space craft of very large size able to lift off the Earth on powering up. It just will not be able to land quite so easily. It will be necessary to develop small craft such as the observed UFOs in order to get down to the surface. That will likely be quite a bit more difficult than the larger craft and will possibly delay a full deployment of the technology. About the Author: Robert Klein writes a daily column, principally about the ongoing scientific debate over Global Warming and Terraforming the Earth that can be followed at: http://globalwarming-arclein.blogspot.com or by googling arclein. Here is some information your readers might want to see about the Pomare disc that is mentioned in this article. It comes from www.ufoarea.com/aas_pomaredisk.html, an excellent site for UFO information. The Pomare Disk - An Alien Artifact? It is the dream and ambition of many in the Ufological field to find something that will prove once and for all that our world is indeed being visited by advanced lifeforms from elsewhere in the universe. What form the "proof" will take is entirely another question. This search for "The Evidence" is at once the crux of all UFO research, and the thorn in the side of many researchers who have inadvertently found themselves caught up in an elaborate hoax, or a case of mis-identification. In many cases, the moral should have been - don't sing the song until you know the tune. Therefore, it is with this primarily in mind that I tentatively start to write this article in order to document the investigations I am currently conducting. I have been in two minds whether or not to get this article written and sent off for publication in the T.S.R. before completion of investigations, but I feel it is important to maintain an ongoing openness where potentially significant research is concerned, unless publicized openness can jeopardize investigations and persons involved. As yet, I have reached no conclusions to the research I am conducting, apart from those laid out at the end of this article, and they are opinionated at my discretion. So, without any further adieu, here are the facts as I have been jotting them down over the last 2-3 months. On Friday the 2nd of February 1996, at approximately 4.00pm I arrived at the business of my friend and fellow UFO researcher Edgar Ortiz in order to interview him as previously arranged about his connections with a Peruvian UFO study group called Mission RAMA. During the course of the interview, I happened to ask him if he had heard of any UFO crashes in Colombia. He answered no, but then informed me that there was a strange artifact in the keeping of a native fisherman living in the San Luis area of San Andres Island in the Caribbean. San Andres is a small island roughly 220 miles East of Nicaragua and is part of an archipelago of small islands and cays known as the Colombian archipelago of San Andres, Providencia and Santa Catalina. All are under Colombian rule. The TruthSeekers South American office of research was moved from Bogota, the capitol of Colombia to San Andres during August of 1995, as well as becoming my new place of residence. When Mr.Ortiz mentioned the artifact, I asked him to elaborate and give me as much information as possible. He then produced four photographs from his office drawer which showed what can only be described as a highly polished metallic dish. He then proceeded to tell me about some research he had carried out with the artifact and its owners, the Pomare family. He said that three months previously, he had been informed by a friend that a native by the name of L.Pomare had an extraordinary object in his possession, one which nobody could identify. He asked his friend to accompany him to the Pomare residence in order to inspect the dish. 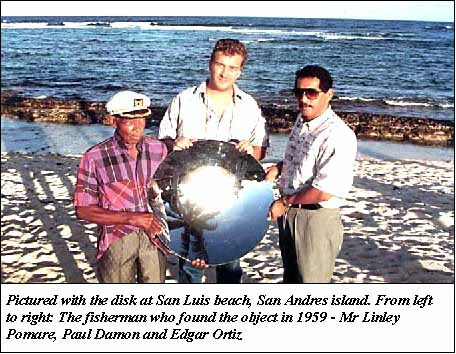 Mr.Ortiz then telephoned another UFO researcher from San Andres by the name of Mario Rojas and asked him if he had heard about the artifact, to which Mr.Rojas replied in the negative. A date was made, and Ortiz, Rojas and the contact travelled to San Luis to the residence of one Mr.Linley Pomare and his family. To cut a long story short, as my investigation has yet to be detailed, Ortiz told me that he inspected the dish-like object and found it to be made of an incredibly hard and durable metallic substance. On a subsequent return trip to experiment with the hardness of the metal, Ortiz and Rojas both tried to pierce the metal with a drill and special drill-bit for putting holes through metals, and found that it barely scratched the surface of the dish. They also tried cutting through the metal with a hack-saw and found it to just slide around without biting into the metal. At this point, Mr.Pomare informed them that if they filled it with water, and left it under the sun for a short time, the water would soon start to boil and evaporate away. Marvelling at this claim, they filled it with water and watched in astonishment as the water began bubbling within a two minute period. When Mario Rojas immersed a finger in the water, it scolded him. Mr.Ortiz then told me that he had not been back since to carry out urther research with the artifact as he had been very busy with other projects. I excitedly asked him about the history of the dish, and where it came from. To this he replied that he did not have all the information, apart from the fact that the fisherman, Mr.Pomare had found it in fairly shallow waters during a fishing expedition to an area close to Bolivar Cay, a very small and unpopulated island some 30 miles South East of San Andres. He then told me something that really seized my curiosity, that Mr.Pomare had found it 37 years ago, in 1959. It was then that I decided without a doubt that I must view this object and document all of the details surrounding it. I asked Mr.Ortiz if he would be willing to take me to see the dish and pick up on his preliminary research, to which he agreed, and we set a date for three days later to contact Mr.Pomare and inspect his mysterious object from the sea. We arrived at the house of the Pomare family at 5.00pm on Monday, February 5th, we being myself, Edgar Ortiz and Mario Rojas who had accompanied Ortiz on the previous trips. I found the house modest in its appearance, adjoined to a restaurant area owned by the fisherman, Mr.Linley Pomare. We entered through the open front door of the restaurant section and Edgar Ortiz called out a greeting as the room was empty. A young lady entered the room from a door at the back and we asked to see Mr.Pomare. She departed the way she came and Mr.Pomare entered shortly after. After introducing me, Edgar asked for the artifact to be brought out, at which Mr.Pomare called the young lady back who turned out to be his daughter, he asked her to get the dish. As she left, I asked Mr.Pomare if he could answer some questions after I had examined it, and he nodded somewhat enthusiastically. We waited for approximately 5 minutes before his daughter returned to the room with the dish, she then put it down on one of the tables. I was primarily struck by the fact that it looked like something made just recently, not over 37 years before. I ran my fingers down the inner sides of the dish and it felt smooth and cold to the touch. Edgar then suggested we take it out to the open ground next to the restaurant as the lighting was bad inside. I took the opportunity to carry it outside and it felt surprisingly heavy. I also noticed that there were no appendages, joins or weld marks as might be customary if it had at some time been attached to another structure, no, it was perfect and pure in shape. Once on the ground, I returned my attention to Mr.Pomare. Being of Afro-Caribbean origin, he spoke good English with a strong Creole-Jamaican accent. My first impression of him was of a bewildered old man, winding down his life after so many years at sea. I addressed him and asked if at any time he had ad someone examine the object, to which he replied affirmatively with a succession of nods. What follows is a transcript of the ensuing conversation as I recorded it. Anything in brackets is my written addition to original script. LP- "Some people from the local government here came to look at it, and then took it away with them for two weeks or so... Maybe longer, but the man in charge was once the Governor of the Island... Palacio... Felix Palacio..."
PD- "How did these people get to find out about the object? Did you contact them?" LP- "No, I didn't contact them... You see Felix Palacio was working at the Casa de Cultura (Cultural House) at that time and he had a senior position there... He was a manager I believe... So, he had friends in the fishing groups and sometime he had been told by another fisherman that I had found something strange in the sea. That is what he told me when he turned up here one day with some people from his office..."
PD- "And you let them take it away for analysis without any worries that you might never see it again?" LP- "Well, I did think that was a possibility, because I thought that maybe someone would say it was theirs and they had lost it... I thought that it might be something to do with the navy." LP- "I don't know, maybe... Or the Americans..."
PD- "Can you remember exactly where and when you found it?" LP- "Well I found it close to Bolivar Cay, there are some good waters for conch (a type of large shelled mussel) out by there, and I found it in 1959, during the rainy season but I don't know the date." PD- "And how long did you have it in your possession before Mr.Palacio came to look at it?" PD- "Twenty years? What did you do with it all that time?" LP- "Well I just kept it in the house... I forgot about it for a long time." PD- "Didn't you show it to anybody like friends or other fishermen?" LP- "There were times, yes, when people would come around to visit and I'd tell them about it and they would look at it... Some people wanted to buy it but I wasn't interested in selling, I feel sentimental about it as on the day I found it I was fishing with my brother and he said that it was probably something very special... Well he died three days later in a boating accident, so I always feel that connection with him when I look at the dish." PD- "I can understand that, did you feel that there was any mysterious connection between the dish and his death?" LP- "No, no... I don't think there is anything bad about the dish, it isn't cursed, actually, one woman said that she was cured of an illness after touching it." LP- "I don't know, something about her back. She's dead now, but at the time she had a back problem, and she visited my wife and looked at the dish and some days later she came back to tell us that her back was no longer giving her any pain or trouble, and she said that the dish was blessed." PD- "That's very interesting. Do you know of any other strange things connected with the dish?" LP- "Well over the years members of my family have said that it has glowed a blue colour during the night from time to time, but I have never seen that happen, you'd have to talk to my daughter." PD- "You mentioned that some people have tried to buy it from you, but can you remember if any of those people were from the Colombian or American Government... Or acted strangely, maybe threateningly?" LP- "I had two men turn up one time, strange gentlemen as I remember, they came into the restaurant and asked me if I had anything I wanted to sell... I asked them like what, and they told me that they were from Lebanon and buyers of antiques and rare objects. I told them that I didn't have anything they would be interested in, and they asked me if I was sure and I told them yes. They turned and left the restaurant, got into a waiting taxi and I never saw them again." PD- "Why did they strike you as being strange?" LP- "Because they were not from Lebanon, and they spoke with an accent that sounded close to German, and I am familiar with German accents as most of the tourists to the island are German... They were very pale skinned and had light hair. I don't think they were from the Lebanon at all. PD- "You seem to have a good memory of this, how long ago did it happen?" LP- "It must be 3 years ago now, I am not sure..." At this point, Edgar Ortiz politely interrupted our conversation and asked me to watch as he positioned the object in such a way so as to allow the sun to shine on it directly. I turned to look as Mario Rojas held up a dirty rag and Ortiz angled the dish so that the sunlight fell on one point of the rag, concentrated as like the effect achieved by magnifying sunlight with a magnifying glass to burn paper. To my astonishment, no sooner than an intense point of light touched the rag, it began to smoulder and then burn with flames in what must have been a duration of 2-3 seconds. What was most extraordinary about this event was the fact that the sun was very low in the sky, being 5.35pm. I wondered what the effect would be if the same experiment was repeated with the midday sun. Mr.Pomare, seeing the surprise in my facial expression then cheerfully added that between the hours of 10.30am and 2.00pm you could put some cooking oil in the dish and fry vegetables with no heat from underneath in a very short time. I stared at Mr.Pomare in disbelief for a few moments before asking him if he was joking with me. As he shook his head from side to side I started to laugh and said - "Do you mean to tell me that you've actually cooked food in this thing?". He replied that he had cooked in it from time to time. My mind boggled at the possibility that this man had innocently cooked and eaten food out of an object that just might possibly have its origins on another world. I then stopped this train of thought and analysed what Mr.Pomare had said. I then turned to Edgar and said that a similar effect can be achieved by cracking an egg on the bonnet of a car, and regardless of the paint colour, the egg would fry nicely as long as it was in the tropical sun at about the same time of day, simply because of heat reflection from sunlight. I then concluded that while I found the aspect of it magnifying sunlight into an intense beam of burning, laser-like light quite interesting, it certainly wasn't something that would make me feel that the object was anything special apart from a highly reflective metallic mirror. While Edgar and Mario continued their burning experiments with other materials, I re-initiated the interview with Mr.Pomare. PD- "Okay, so you said earlier that you found the dish close to Bolivar Cay..."
PD- "How did you come to notice it?" LP- "Well my brother and I were diving for conch in shallow waters, actually very close to a sandbank, and we must have been about 15 to 20 feet down when I saw something sparkling very brightly some way ahead of me... It was like somebody was shining a very bright light from the sea-bed. I swam towards it then and found it to be buried in the sand... I swam up for air then, and after a minute I swam back down and pulled it from the sand and then swam to the boat with it and put it inside. That was when my brother joined me and we both got out of the water and into the boat..."
PD- "What did you think it was?" LP- "I didn't know what it was but I thought it might have dropped out of another boat... I knew that it couldn't have come from a big ship because the waters were too shallow." PD- "And how did it look when you first found it?" LP- "Well exactly like it is now." PD- "What I mean is were there any signs of rust, oxidization, any discoloration of the metal?" LP- "No, it was very shiny and clean... There wasn't even any algae or plant life growing on it." PD- "Do you remember seeing anything else in the area of water that might of been connected with the dish?" LP- "Well there wasn't really anything else to see apart from sand and empty conch shells, the dish stood out because it was reflecting the sunlight... I didn't think at the time to have a better look around." PD- "So, getting back to the time when Mr.Palacio examined the dish, what results did he give you?" LP- "Well he couldn't give me any results because he said that it wasn't anything he had seen before." PD- "Did he tell you what kind of tests he had conducted on it?" LP- "He did, yes, but the tests had been done by the navy people, and they reported to Felix that they could not cut a piece out of the dish for analysis..."
PD- "You mean the Colombian navy right?" LP- "I imagine so, they told him that it was not from anything they use, on the ships and suchlike, and they didn't know what the metal was..."
PD- "Did they arrive at the conclusion that it was an unknown metal via a specific test? What tests did they carry out?" LP- "Well they could only test the hardness of the metal, and they tried to melt it, drill it, cut it, hammer it but, it wouldn't give... They gave up and passed it back to Mr.Palacio saying that it should be kept on the island, and that's all." PD- "Was this Felix Palacio involved in any of the tests?" LP- "I don't remember, you'd have to speak to him yourself." PD- "And what was his conclusion?" LP- "Well all he could say is that it had probably come from a satellite, because the metal was very strange." PD- "Do you have any documentation or reports from Mr.Palacio or the navy stating what you just told me?" LP- "No, but I know that Felix has something from the navy, or he did have, it was a long time ago now..." I wrapped up the interview there, and went over to take a closer look at the disk. I had brought with me a small hand-held microscope of 30x strength and looked at the reflective surface of the dish. Under the microscope it did in fact appear to be scratched in many places, but I noticed that if I rubbed the scratches with my finger, they would "disappear". I then looked at the outer edge of the dish which was approximately a quarter inch in thickness. I was quite surprised to find that the metal was layered. In all, I counted 12 layers and concluded that the dish had not been moulded as a whole, but had been somehow folded. I noted that the layering effect was definitely not due to the metal being cut with a grooved edged instrument because the layering was fine and precise without line curving in length or depth, this struck me as being odd though not having any experience with metallurgy I didn't let it inspire me too much without some research into the subject. What I had to keep in mind always was the fact that this thing had been found in 1959, and nobody knows how long it had been on the sea-bed. So, in order to research the construction of layered metals, I would have to find an old book which might give some clues. I knew for a fact that I would have to at some time get in touch with Mr.Felix Palacio in order to try and get any reports he may have been given in the past. I then flipped the dish over with the reflective-concave side facing the ground and the convex side to the sky. This side was completely black, but it was due to a coating of some substance that was uniformly spread. It didn't seem to be any kind of paint coating I have seen before, and did not have a lacquered effect about it, rather it was of a dull black hue. I searched the surface for any signs of bubbling or damage due to heat which might help prove that it had "fallen" through the atmosphere as part of a redundant satellite - but found none. I then produced a coin out of my pocket and tried to scratch a small area to see if it would flake off. I did succeed in scratching down to the silvery metal underneath but there was no residue, nothing that I could scrape off the coin in order for the black-material to be analysed. What happened next took me completely by surprise, for the scratch had disappeared within a few moments and the black material was once again intact. I searched for the scratch for a good five minutes to no avail. I then scratched off another small strip, and examined the exposed metal under the hand-held microscope, and found the metal to be different from the polished side, for I could clearly see a lattice- crystalline structure to it, and the edges of the black substance where it had been scratched away also seemed to have crystalline branches, I say crystalline not only because of the shape but because it seemed to have millions of tiny bright specks incorporated into the coating, which were not apparent with the naked ey. I waited for a short time to see if the scratch would disappear again, keenly looking at it under the microscope, but I saw no changes, that is until I had taken my eyes off it to talk to Edgar, and that was for about half a minute, and when I looked back at the spot, I could not find the scratch. I convinced myself that this was more of a case of my not looking well enough, and decided that on a return trip I would attempt with a specific tool to peel off some of the black material for tests. Edgar then asked me to flip it over, which I did and then he tapped the outer edge with a spanner, and told me to listen closely. What I heard was the subsequent vibration from the impact of the spanner, but the sound was very sharp and clear, one-toned with no distortions which indicated to me that the dish was very well made and pure in its own geometry. The audible vibration lasted for three minutes and eight seconds. After a period of four and a half minutes, I touched the outer edge with my finger and could easily feel the continuing vibration. After measuring and weighing the dish, Edgar, Mario and myself left, but not before arranging another time to visit in order to try and get a sample of both the metal and black substance for analysis. We told Mr.Pomare that he should keep it hidden away until such time as we return, as it may be of high value (or even priceless) which we would try to determine in the future. He then informed us that he would be keeping it at another residence as he could now see that it was of some importance to us, and maybe others who might find out about it and try to steal it. We said our farewells and went on our way. After that first visit, I came away with mixed feelings. I had never seen anything like it before and it looked truly mysterious, for it is seemingly something without an obvious purpose. Hey great article and really innovative ideas! Instead of thinking of isolated systems like most designs this author really had a futuristic vision. Wow. Excellent! Thanks. 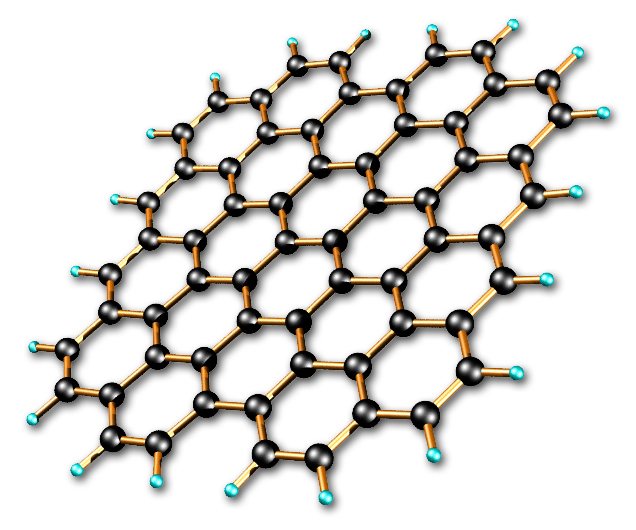 I wonder if the silver material that was found in Roswell could be this graphene material. Who knows what a civilization far more advanced than we could design... this really made me think about the possibilities. Great atricle.